What’s Better For Your Car: Synthetic Or Conventional Oil? Choosing the correct motor oil of your car is imperative if you want it to run well for a long time. The trouble is, what type of oil should you choose? What’s better for your car – synthetic motor oil or non-synthetic oil? While I don’t claim to be a car expert, over the years I have gained enough knowledge about cars – particularly mine, of course – to know that keeping a regular schedule of oil change is a must if you want your car to run well and last a long time. Most of what I’ve learned has come from listening and talking to my mechanic, as well as a little trial and error. While I didn’t like the errors, they did serve to build my knowledge bank. But, one of the things that have always befuddled me – and perhaps you as well – is the difference between the synthetic brand of motor oil and the good old, basic natural oil that’s been around for decades. For most modern cars, changing the oil and rotating your tires are the first and most common things car owners should be doing – as well as maintaining the vehicle manufacturers regular service schedule. But, there are more types of motor oil out there today than ever before and it can get confusing. That’s why I leave it to my trusted mechanic to select the right oil for my car. But, that still left me wondering which oil is better and what makes synthetic oil different from conventional oil? There are two components that determine how well motor oil will perform in your car. One factor is the base oil and the second is the combination of chemicals (additives) that are added to the base oil. The basic kind of oil is a by-product of refined crude oil that comes out of the ground (often referred to as ‘base’ oil). Refining helps reduce the impurities in the oil, but the end product has molecules that vary in size. This inconsistency in size can result in restricted flow when working its way through the engine. Synthetic oil, on the other hand, contains molecules that are manufactured and are all the same size and shape. This uniformity creates less friction in the engine and allows the oil to move throughout the engine smoothly thereby providing better performance. Additives added to the base oil are what give the oil the characteristics it needs to do its job. Although additives are typically only 15 to 25 percent of the make-up of motor oil, they can impact a lubricant's performance much more than the base oil. For example, mineral-based motor oil with a very good additive package can easily outperform synthetic motor oil with a mediocre additive package. 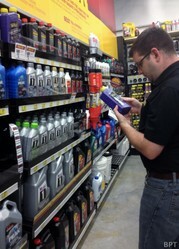 There is no easy way for a consumer to determine the quality of motor oil’s additive package. While, price is one way to judge the quality, since the more advanced additive technologies cost more to produce, performance is the ultimate measure of additive package quality. The ongoing development of these additives are a major part of the reason that cars can now be driven 5,000 or more miles between oil changes that used to have to be made every 3,000 miles. And some newer blends are now touting that they can give your car 10,000-12,000 between oil changes. This not only saves time and money but it is also good for the environment since less oil will need to be disposed of. By the way, if you get your oil change and a quick service type of facility or from a mechanic that insists on changing the oil every 3,000 miles even though you have a late model car quickly find another service center – someone is trying to pull a fast one on you. If, however, you drive a 10-year-old car or older, stick to that 3,000 mile oil change schedule. So, how do you know which oil is best for your car? There are a number of factors to consider. First, check to see what your car’s manufacturer recommends. In some newer vehicles there are even issues governing the use of certain oils and gasoline blends to be used in order to maintain the car’s warranty. The type of car you drive is also a factor. Sports and high performance cars, as well as large cars that may haul heavy loads have particular needs including the oil. Older cars may need special consideration as well. But, there is a price to pay when using synthetics. They almost always cost more than conventional oil. But, you’ll have to do some calculating to determine if the less frequent oil changes with synthetic balance its higher cost. The prices of motor oils – whichever kind you buy – vary greatly. You can pay a high price for one brand and then see the exact same brand sold for less at another store. Oil manufacturers know that drivers get in the habit of sticking with a product they know and/or have used in the car since they bought it. Mechanics tend to stick with one brand for the cars they service. From my research, however, all brands are pretty much alike. The well-respected Consumer Reports said while brands of motor oil don’t matter all that much, what is important is its viscosity grade (that’s the 10W-30, or similar number/letter combination you’ll find on the product - the two numbers refer to the oil’s viscosity properties during a cold start; the W stands for “winter”). It’s hard for a layman to know what that means for your particular car, so I’ve found the best advice is to rely on your mechanic, or even better, follow what it says in the car’s manual. The manual may also suggest whether you should use synthetic or conventional oil. Premium automotive motor oil with Deposit Shield protects against deposit and sludge formation and provides excellent wear protection of critical engine parts. The one decision that can take you into car hell is buying an oil brand you – and few other people – have ever heard of or is so cheap you wonder if what’s inside of it is what the container says it is. And there are instances of oil products having been diluted, mislabeled or otherwise tampered with. So be careful. Of course various oil brands are very competitive and you can often find sales. That’s a good thing and you might want to stock up when you see a good deal (you can even bring the oil to your mechanic – if you are not changing the oil yourself – so that you don’t have to buy the higher priced oil that your mechanic sells (it might be the same oil you bought, but most mechanics will add a markup or they’ve bought it at a volume discount and they keep the difference). So, what should you use – synthetic or conventional? Here’s what I came up with. If you fit into any of the following categories go with synthetic: Turbocharged or supercharged engines; High-performance engines; Engines that are frequently pushed hard; Engines that do a lot of towing or hauling heavy loads; you live in climate extremes. If these are not what you normally experience, conventional oil may be just fine (assuming you don’t go against what the car manufacturer suggests or demands as part of the car’s warranty – in fact, synthetic oil may already be in the car when you buy it). Finally, there are many drivers who will claim a certain type or brand of oil gives their car better performance. That’s not likely the case, as long as you use the proper oil for your driving conditions as indicated above. And as for better mileage, those claims are suspect. If a car is well maintained and is not driven with a lead foot, it will likely get the maximum MPG no matter which oil is used. I fully accept my amateur standing when it comes to cars. But, I’ve read a lot about motor oils and I believe what I’ve presented are good guidelines to follow. My mechanic (I use an independent mechanic – I never use the car dealer’s car maintenance services) believes I’ve got it right, but there are sure to be others who might argue otherwise. That’s ok; it’s probably a topic that can and will be discussed until there is no more oil and we’re all driving horse and buggies once again. TheWritingCowboy, Why do you never use the dealership's car maintenance services? No matter what model Ford you own, we have the replacement car keys you need! Tent garage can provide a decent replacement for the classic garage, offering enough protection from weather elements. Not all of us are knowledgeable about how to check the oil, or where the windshield fluid goes, so I have created a car maintenance list for the novice in all of us.